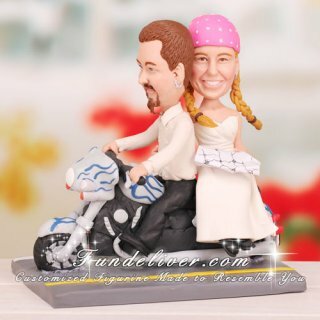 This is a completely customized travel theme wedding cake topper ordered by one of our customers. They are getting married on the beach in Tybee Island, GA, and riding the bike all the way to Key West, FL. It will be about a two day trip down, and the route they have planned will be 831 miles one way. They are very excited about the trip - going down A1A, across alligator alley.... Just rambling. Thus they would like to order this travel wedding cake topper to memorialize the trip. The groom is wearing plain motorcycle boots and a shirt with his black pants. The color of shirt is natural. It has stitching on the front, and pearl snaps up the front and on the cuffs. The bride is wearing black motorcycle boots and a white wedding dress with no bow on the back. At their ceremony she will be lacing it up, and then tucking the ribbon inside the dress so the bow will not show. 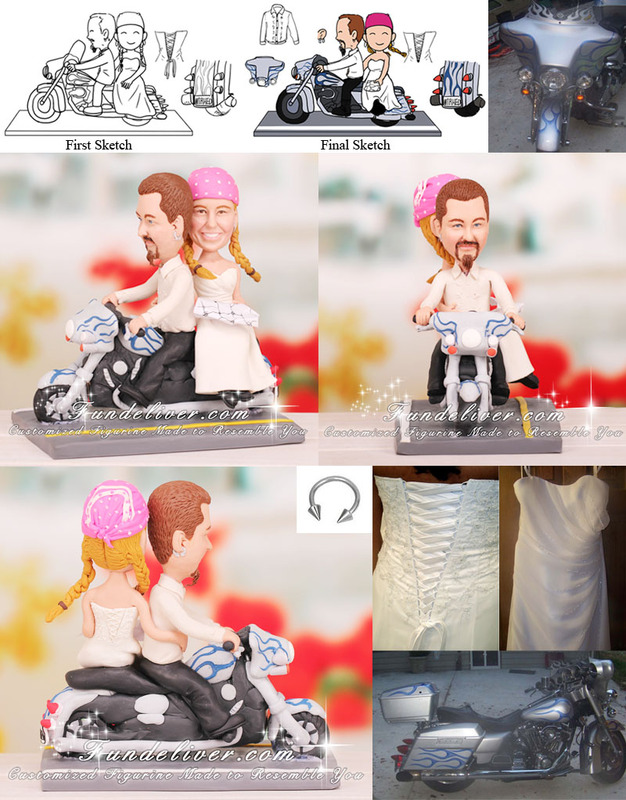 They would like the groom to be riding their bike (2006 Harley Davidson Electra Glide with customized painting) without tour pack and the bride to be sitting behind, holding a map to navigate for the groom. Since they are going to be traveling so far, without the map and bride’s navigation, then maybe they can come up with something else. The bride’s body is turned a little more toward groom slightly and her pigtails are flying in the air to look like they are riding down the street. Have similar travel or trip theme wedding and want to create a travel/trip wedding cake topper to reflect your theme? We can make it. Just send us your idea and reference images, we will first draw some sketches to get your approval and then turn it into 3D figurine.